When the Four Horsemen launched their Kickstarter, they had six birds ready to go - the rest were left to be stretch goals. 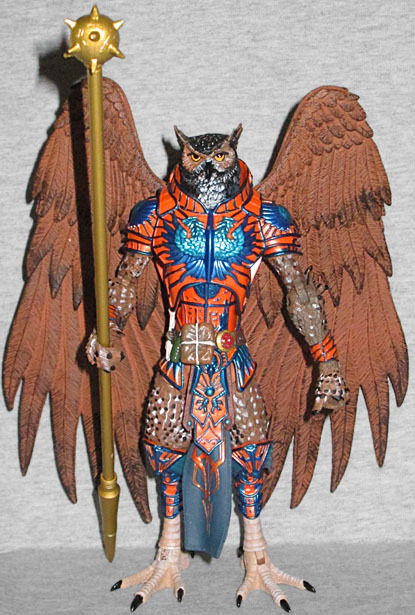 The fourth unlocked was the owl, eventually named Atheneus (after the goddess Athena, who was associated with owls). 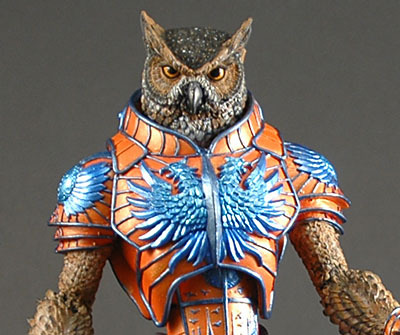 While the previous stretch goal, Phoenius, had blue armor with orange highlights, Atheneus' is orange with blue. It's a garish combination, to be sure. The variant birds don't get the same ornate weapon as Decimus - just a staff with the spiked mace head on one end, and a sharp spike on the other. His feathers match the light brown wings, if you're buying those add-ons, but they also have expertly applied black and white speckles. His feet are a pale tan, nearly white. Atheneus' head is sculpted excellently, of course, but it's brought low by the paint. The brown used on it is too dark, so it doesn't match the body. 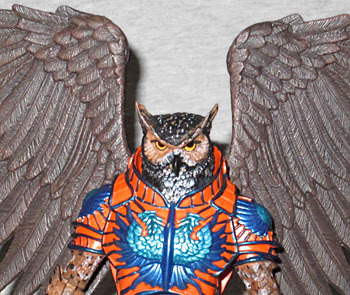 It's even darker than the "dark" wings! The prototype figure definitely had darker feathers on the head than on the body, but it was offset by large areas of lighter paint. Also, the image on the back of the card shows his pupils pointing toward the center of his eyes, while the ones on the final toy point upward (and the left one on mine was applied slightly too high).